​St. John is the smallest of the three islands that make up the United States Virgin Islands in the Caribbean. It is known for the Virgin Islands National Park, warm waters and pristine beaches. After Rockefeller opened his famous Caneel Bay Resort in 1956, St. John soon became a secluded getaway for celebrities and world leaders. Only accessible by boat, the island’s remote location provided exclusivity and privacy. If you had to ask how to get here, you were probably looking for the wrong island. Fifty years later, and with around 60% of the island under the auspices of the US National Park system, thousands of people every year are discovering its unspoiled beauty. With accommodations ranging from campgrounds to luxury villas, there is something to suit every taste and budget. You still need to take a ferry to get here, so climb aboard; getting to the island is half the fun! Since St. John does not have its own airport, visitors must fly into neighboring St. Thomas and take a ferry. The Cyril E. King Airport (STT) of St. Thomas is an important hub in the Caribbean and is served by many major airlines. Many US east coast departure points have direct flights to the island. The airport does not utilize jet bridges so you will walk down a staircase parked next to the plane; it’s one of the charms of arriving at a tropical destination. Many planes will open both exits for deplaning so keep a look out behind you; being seated at the back no longer means getting off last. What Ferry Should I Take? Pick up rental car from the airport and drive to the car barge at Red Hook. The rental agent can give you a map and directions. Smartphone GPS also works. There are signs that point you to Red Hook along the way. Bring some cash to pay the port fee and purchase the barge ticket. You can purchase a roundtrip ticket for a little less money but you have to ride back with the same operator. Their schedule is printed on the ticket. Call your greeter and let them know you’re on the car ferry. Enjoy the ride. Your greeter will meet you near the car barge parking lot on St. John and guide you to the villa. This is the most economical option because renting a vehicle on St. John can be more expensive. Just make sure to check that the rental agency will allow you to take the vehicle over to St. John. AVIS allows it. Hertz does not. Call ahead if you are unsure. This is also the most comfortable option because you don’t need to get out of the car until you get to the villa. This option is good if you have small children that need car seats or elderly travellers that want to avoid a lot of walking. The downside of this option is that if you do not make the last car ferry, your car will be stuck on St. Thomas for the night. Please call you greeter ASAP if you think this might happen. If your flight arrives after 4PM, there is a significant risk that this will happen. Due to the loss of several barges from the hurricanes, the car barge schedule is unreliable and we recommend that guests rent their cars on St. John. We will update this as the situation improves. Take a taxi from the airport to Red Hook. Taxis are shared and may make several stops before getting to Red Hook. Buy tickets and take the next passenger ferry to St. John. Call the greeter when you are on the ferry. Your greeter will meet you at the gated entrance to passenger ferry dock in Cruz Bay and help you get to your rental car. Your greeter will then guide you to the villa. 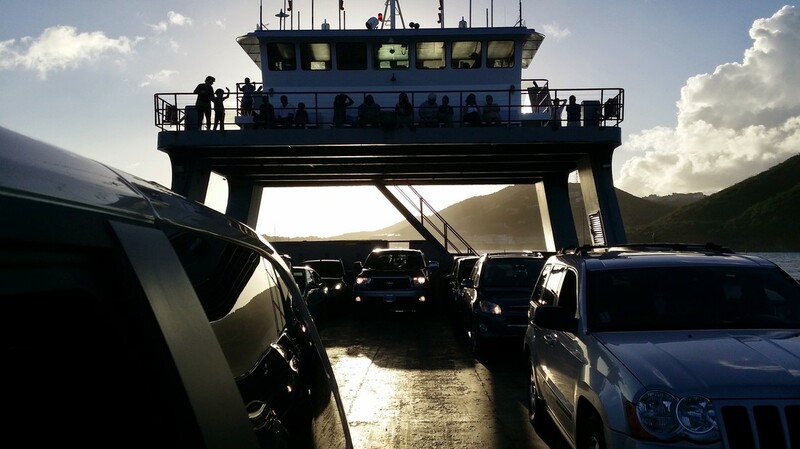 This is the most convenient option because you don’t need to worry about driving through St. Thomas or making the last car ferry. There is an additional ferry that leaves from Charlotte Amalie (the downtown harbor) that is much closer to the airport. This ferry is not recommended because It only runs three times a day. Once you’re at the villa, relax. If you are using a smartphone GPS, connect to the WIFI in the villa and download an offline map because data coverage on the island can be spotty. If you are using Google Maps, search for “Ardisia” to get directions back to the villa.